X-Factor USB drives in PC World right now. Thank god! Kingston Technology has kindly notified us that it has finally developed the technology that is going to make all our lives easier and more fulfilling - the X Factor USB Drive. 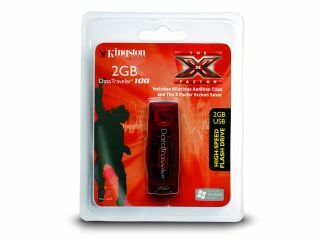 Kingston Technology Europe Ltd. announced the 2GB USB Flash drive ‘pre-loaded with a video of the popular The X Factor program including clips of funny auditions [and] a unique X Factor PC screen saver featuring the theme music of the show in MP3’ available now at PC World for £11.99. “Coming to market with our first USB drive pre-loaded with content is great news and a further step towards our commitment to offering unique products to our customers,” said Kirsty Miller, European Flash Product Marketing Manager, Kingston Technology. Aside from posing the question of ‘why?’ what else can we tell you about this latest example of X Factor merchandising gone mad. Amazingly, Kingston has identified the perfect niche market for their product, informing us that “this USB stick is a must-have for fans and non-fans of the show alike” – so that is, like, EVERYONE IN THE WORLD! The stick also rocks a capless design and…. Oh, forget it!